Shortly before the British launch of An Evil Eye, a greedy web-hosting company in Melbourne made off with my website. Largely on principle (and partly because they asked for money, and I’d lost all my original set-up passwords, user names and such), I have walked away from it, with my nose in the air. I’m about to start another at www.jasongoodwin.info. My children assure me that the dot-info tag is very low, but there’s someone else who has .com and frankly, .info describes exactly what I want. Plus it’s delightfully cheap. Meantime, apologies to anyone searching elsewhere on the web. Come back later! And here is Marco Ventura’s delicious cover, for Faber in the UK. This entry was posted on July 9, 2011 by admin. It just “shows to go ya} how far afield a great story [series] can travel and what effects may happen because of that. No matter where you go, we’re gonna follow :-). 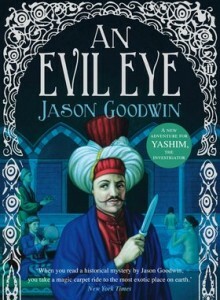 Just finished reading Evil Eye – another tasty, fascinating, enthralling trip! Have loved them all. For anyone who has visited Istanbul, your books bring it ALL back – sights, tastes, smells, sounds……….thanks! Wow, I love the non-US covers for the Yashim books more than the ones we see here in the states! I think I’m going to have to start ordering your books overseas from now on, unless perhaps some rereleases are in the works for US editons? Loved ‘An Evil Eye’, by the way! Thank you for your wonderful stories! I loved ‘An Evil Eye’ and I’m really digging those U.K. covers. I like how were getting more varied perspectives from different characters, especially the women in the harem. When you’re done with Yashim, ever think about doing a book from Palewski’s P.O.V., perhaps a first-person perspective? Thank you again, your stories are excellent and I look forward to the next entry!